Russian vodka is the most famous and widespread strong alcoholic drink, whose history dates back to the 15th century. However, there is still no definite answer who was the first to prepare this strong, alcoholic and national Russian drink. Today there are several types of vodka: traditional vodka (bread wine), special vodka, and fruit vodka. 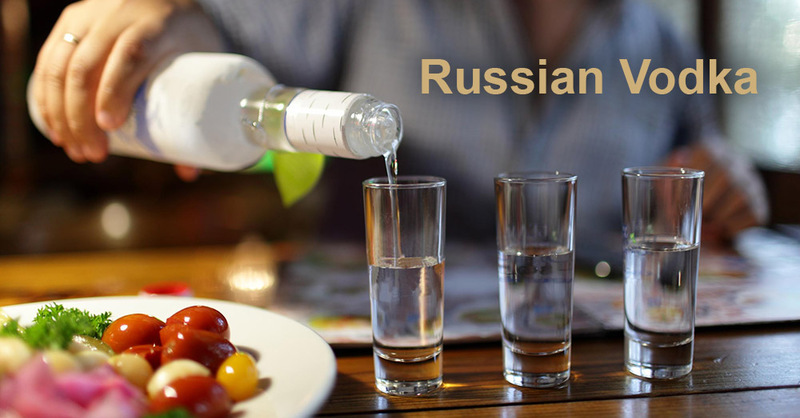 In Russia, traditional vodka is a 40% solution of alcohol in water from fusel oil. The purification is carried out in hot or cold ways. Alcohol is diluted with water, and then it is filtered through charcoal in several barrels. It is done in order to get rid of a large amounts of fusel oil. Special vodka is made with adding various essential oils and special aromatic substances which are dissolved in traditional vodka. The make fruit vodka, the juice squeezed from ripe berries with the sugar added is left to ferment. The fermentation process happens because of the yeast added. Later it is distillated. Vodka appeared in Russian by the end of the 14th century. In 1386 the Genoese ambassadors brought first vodka (aqua vitae – “живая вода”) to Moscow. In Europe all famous alcoholic drinks, such as whiskey, brandy, cognac, schnapps, etc. originated from aqua vita (“аква витa”). Later in 1429 aqua vitae was brought to Moscow again. This time as a universal medicine. The idea of diluting spirits with water triggered the production of Russian vodka. And then it began to be made of grain. Later vodka appeared in Russia thanks to the great scientist Dmitry Mendeleev, who first mixed a liter of spirits with a liter of water. He discovered that when contacting with water, spirits is compressed, therefore, you get now two liters of mixture but a little less. Mendeleev developed a doctoral thesis on the basis of this discovery. Later he continued his search for ideal vodka. In 1884, he received an official patent for this drink which was called “Moscow Special”. It became the standard for Russian vodka. As compared to other alcohol, vodka is the purest alcohol drink. 100 grams of vodka contain 235 calories. Vodka’s expiry time is 12 months. Vodka reveals its taste and flavour only when it is cold. The weight of one liter of vodka is exactly 953 grams, as spirits gets compressed with water. The most purified vodka is the most toxic. Despite the fact that vodka is a deceitful drink, it is still a drink for festivals, a drink which makes people happy, so you should have it during a festival. If you ever decide to try this Russian drink, you should consume it in modest quantities!